Posted November 11th, 2003 by Ms. Jen & filed under art + photography. 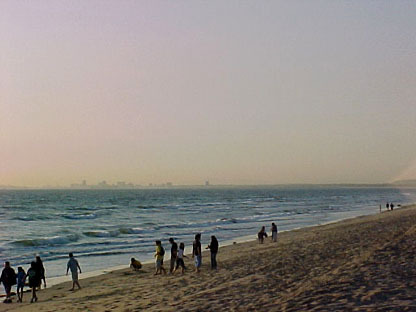 Downtown Long Beach and the Port of Los Angeles as viewed from Bolsa Chica State Beach during the October 2002 Longshoresman Strike. 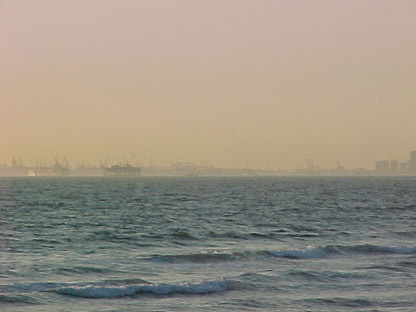 The Pacific Ocean south of Palos Verdes and north of Newport Beach was filled with over 65 container ships on this late fall afternoon waiting for the strike to be over and the Port to open. Posted November 10th, 2003 by Ms. Jen & filed under art + photography. Erika and I were in a german artist’s art installation piece at the MOCA Geffen Contemporary, when I looked down and realized we needed a camera! We went in search of Thomas and his digital camera, I held it down while we turned our back on the guard. Erika pretended to ask Thomas what the german writing on the wall was saying, then we all looked down. Snap! Posted November 10th, 2003 by Ms. Jen & filed under fun stuff. 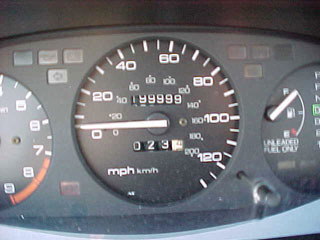 Today at 11:53am, Sugar Plum, my lovely 1993 Honda Civic, turned 199,999 miles. At approx. 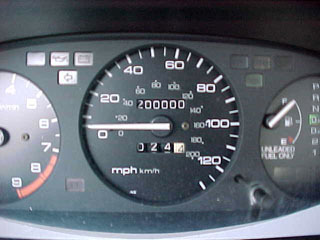 12:04PM, after a stop at the cleaners, Sugar Plum turned 200,000 on McFadden Ave. Go Sugar Plum Go! Posted November 9th, 2003 by Ms. Jen & filed under news + events. Today I went to the bridal shower of a good friend of mine, Amanda Cunagin. It was one of the nicest wedding showers I have ever attended, bravo to Heather Teal, Lisa Lavine, and Arianna Shackelford for throwing such a great and lovely party at Heather & Dave Shackelford’s home. There were a hundred gallons at the least. That can without depletion overflow. That this world’s fullness is not made but found. And pour its plenty out for such as you. I toast you both, good son and dear new daughter. And may that water smack of Cana’s wine. Many blessings on Amanda and Andrew! Posted November 8th, 2003 by Ms. Jen & filed under ideas + opinions. Posted November 8th, 2003 by Ms. Jen & filed under fun stuff. On Thursday evening, Thomas, Erika, and I went up to MOCA for the free Thursdays. We parked in Little Tokyo and started at the Geffen Contemporary for the “Sitings: Installation Art 1969 – 2002” exhibition. Murray had raved to me about the Frank Gehry’s “Works in Progress” exhibition up at the main MOCA space, but after viewing both exhibitions, I preferred a few of the installations at the Geffen that were so delightful, lilting, and just plain fun that when I got to Gehry’s exhibition I wanted to plop in the middle of Gehry’s models and interact with them. That would have been a no go. Security is funny that way. 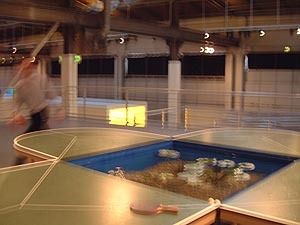 Orozco’s two installations were on the second floor landing, the “Toilet Ventilators” were 4 ceiling fans with rolls of toilet paper at the end of each fan blade trailing toilet paper through the air over the “Ping Pond Table” installation. From the entrance of the Geffen, one would look to the left and see the festive ceiling fans with their streamers, it was only upon arriving up on the second floor landing that I realized that the streamers were toilet paper. 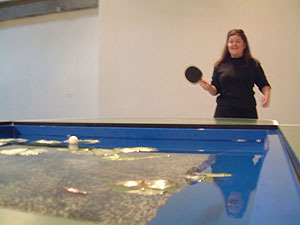 The “Ping Pond Table” was manufactured in a four-leafed clover shape with a lily pond in the middle where the net ought to be. Erika asked security if we were allowed to play ping pond. And we were. And we did. And we had a blast. And we lost lots of balls to the pond, we plucked them out, shook off the water and continued on. A group of students from Point Loma University joined us and we played four way ping pond. Thomas had his camera and Erika took the photos that you see here. Get thee down to the Geffen and play water ping pond. Posted November 7th, 2003 by Ms. Jen & filed under art + photography. 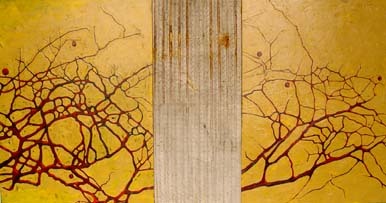 I have just finished the final touches on Los Angeles area painter Dan Callis’ new website. Posted November 5th, 2003 by Ms. Jen & filed under art + photography. As I was out running errands today, I tuned into the local NPR station and heard Fresh Air’s Terry Gross interviewing Wanda Jackson. She had several hits in the late ’50s and early ’60s, including “Mean Mean Man,” “Let’s Have a Party” and “Fujiyama Mama.” In the ’70s she kept recording music, mostly gospel. She’s 65 now and still touring. She’s just released her first studio recording in 15 years, Heart Trouble. Guest musicians, including Elvis Costello and The Cramps, join her for several tracks. I recommend tuning into your NPR station today for Fresh Air or listening to the interview online. Not only is Wanda Jackson one of the most gracious women alive, but she is a pleasure to listen to. Fresh Air plays a few tracks off the new album. UPDATE: Sigh… I meant to post this over on the Barflies.net Blog, but instead chose my bookmark too quickly without looking… Oops.